Chef Galvan is working overtime on using fresh local ingredients. 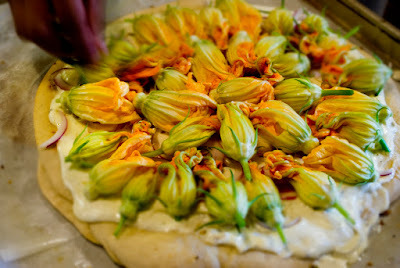 Yesterday he went out to our garden and picked some squash blossoms for a flatbread appetizer. In the photo you can see him applying a balsamic glaze that he made on the spot. There isn't much that we don't prepare ourselves here in our hill country bed and breakfast kitchen.